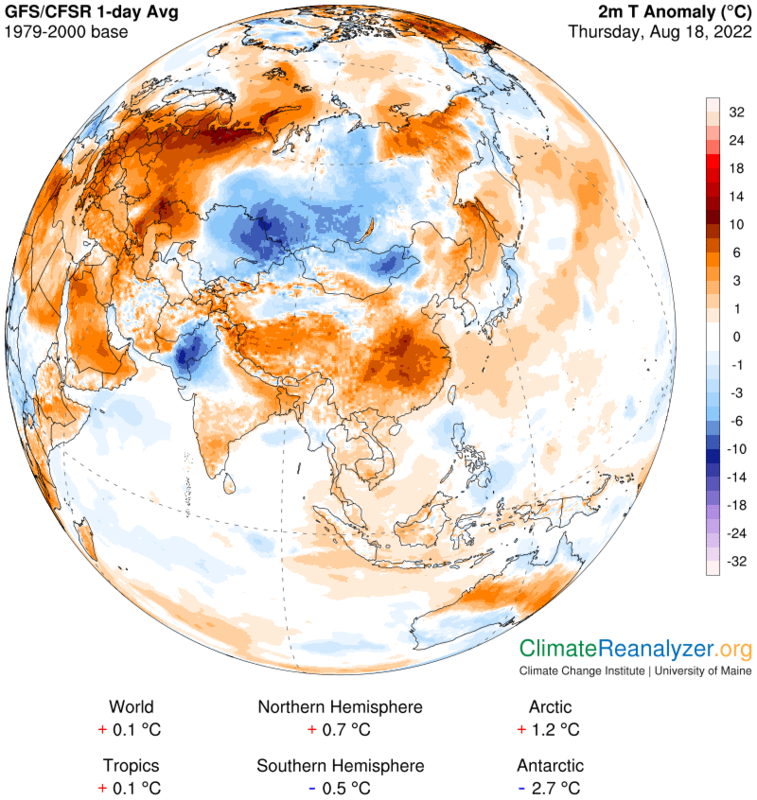 A huge swath of northern Siberia is currently around 20C above average with temps as high as 29C. And the winds are blowing right out into the Arctic Circle. Nice summary – and I concur with the “just insane” analysis. What chance can permafrost have in the face of such temps? Are pingos going to blow all over Siberia like popcorn on a hot skillet? Why, it’s almost as if things were happening . . . faster than expected. For the financial year just finished, Australia experienced its hottest July-June period on record. Rather concerning considering that much of that period was influenced by mild La Nina conditions. Outlook for the next three months – above average temperatures. I’m no climatologist and my hunch here is based on nothing but a gut feeling.. but I fear what the next strong El Nino will bring. These days hearing the word El Nino makes me think of the theme song to Jaws. how about an analysis of the impact of the climate changes on food crops? We are losing crops here in Europe already and it is noticeable on the supermarket shelves now. I have seen no evidence of governments preparing to manage the fluctuations in food supply or informing populations of the causes of the current shortages of certain vegetables and salads. I’ll see what I can do. I keep track of the larger FAO Index and note that though food prices are high, we’re not in a situation similar to the Arab Spring at this time. Reports of shortages in Europe would be notable. Will check. However, with an unnecessary and harmful Trump-driven trade war heating up, we are dealing with political impacts to food distribution as well. So it begins. Here in Raleigh there haven’t been any edible oranges in the grocery stores for about three weeks. Same thing last year for a time. Three of the most revered Southern crops have not been seen in grocery stores for over a year or more now, and would have to be hunted down at the local farmer’s market, if there at all. For the last two years, you have to have your own pecan tree to have a fresh pecan. China, I believe, is buying all our crop. And in general, fresh produce in the grocery stores for the last year or two is becoming older and older. I wonder what happens to the nutrients in old produce. I have been afraid the past two years that the speeding heat of climate change is going to overtake any other crisis that mght happen to us financial or economic or a big war.my fear is for threatening food supplies in North America before we can even imagine it. Of course, this will happen all over the world. China’s iron fist tightens it’s grip on polluting industries with the release of the country’s 2018 to 2020 pollution action plan published on Tuesday. It will expand the number of cities and provinces subject to the crackdown and will include the country’s major coal producing regions and heavily industrialised zones. It also said no new capacity for steel, coke and primary aluminum production will be allowed in the regions through to 2020, and that steel capacity in Hebei, the country’s largest steelmaking province, will be capped at 200 million tonnes by 2020, down from 286 million tonnes in 2013. Chinese authorities will also take more action to tackle small-scale “scattered” pollution sources, and will work to cut off water, electricity and raw material supplies to firms that violate rules. The cabinet also set an annual production and sales target for “new energy” vehicles at around 2 million vehicles a year by 2020, up from the expected ~1 million this year. If I’m not mistaken this’ll be the first AC/DC song ever posted on RobertScribbler. I dedicate it to Elon Musk, Sanjeev Gupta and Xi Jinping. Not sure if it is the first AC/DC, but is definitely the first AC/DC featuring a bagpipe solo!!! It would Help If Canadian Weather Stations gave the correct temperatures. I live in Vancouver and yesterday it was hot. I noticed how hot it was when I went outside. I have several mercury thermometers around the house and they all read the same temperature, 35°C. The weather station said it was only 23°C. I checked other Canadian weather stations and they all lowballed the actual temperature. These stations report across Canada. Those deaths could have been avoided if the weather stations did their jobs and reported the correct temperatures. If mistakes were being made then you would expect to see temperatures both above and below actual temperatures. Vancouver had a heatwave 2 weeks ago and the same lowballing of temperatures happened then too. By altering their own records, weather stations can claim no heatwave occurred and thus Global Warming is not having an effect in Canada. Which is problematic with people dropping dead of heatwaves so i don’t think that is the reason. Current forecast still says 23C feels like 26C. Difference with the house thermometers…they might be exposed to the sun or the whole house is warmed up and they are measuring that? Thanks for covering this. GW is already taking lives. Has been for some time, actually. Scottsdale airport, Arizona, had a low of 95 degrees just this morning, July 6. This is probably the highest minimum ever recorded at this station. I have tried to find info online as to what the all-time high minimum was at this airport before today, but have been unable to so far. Quick question for you, Robert, and one that has nothing to do with the subject of this post. I was checking NOAA ESRL for the updated June CO2 levels – 410.79 if you’re “keeping score” – but am having trouble finding who tracks CO2e. Are there universities or met offices out there that regularly report this? Thanks! NOAA tracks CO2 as measured at the Mauna Loa Observatory and through readings collected at multiple sites around the globe. If you search on the ESRL site, it will provide you with a map of CO2 monitoring locations. Thank you ! Guess I just needed to scratch a bit harder . . . Sorry, didn’t read my own writing as posted – I mean to post “CO2e” and it didn’t come through (“CO2 equivalent”, in case it doesn’t post again). Thanks! Washington is often hot in the summer, of course, but the heat wave of the past week has been decidedly abnormal. “For the week through Tuesday, 227 U.S. records were broken for highest temperature for particular days, and another 157 were tied, federal statistics show,” Malcolm Ritter of The Associated Press reported. Burlington, Vt., for example, experienced its highest daily low temperature on record: On Monday, the temperature never fell below 80 degrees. It’s not just the United States, either. “From the normally mild summer climes of Ireland, Scotland and Canada to the scorching Middle East, numerous locations in the Northern Hemisphere have witnessed their hottest weather ever recorded over the past week,” Jason Samenow of The Washington Post wrote. Scott Pruitt resigned as the head of the Environmental Protection Agency on Thursday, after one of the most scandal-marred cabinet tenures of any official. Pruitt abused his office for personal gain in ways large, small and even ridiculous. Lydia O’Connor of HuffPost has a good list. Yet the worst thing about Pruitt’s tenure still wasn’t his personal corruption. It was his aggressive campaign to aggravate global warming, by rolling back federal attempts to combat it. Pruitt’s career — from Oklahoma attorney general to E.P.A. administrator — has been defined by his attempt to maximize the profits of energy companies, regardless of the effects on everyone else. That attitude will almost certainly outlast Pruitt, unfortunately. It is effectively the official policy of the Trump administration. You can expect many more heat waves in the years to come. Looks pretty hellacious in SoCal the past 24 hours. Check out these insane but real stats from the NWS offices there. Note that a few places had lows around 90 degrees in this non-desert area, and one place, Chino, hit 120 degrees. Some places were about 40 degrees above normal. Precipitation past 24 hours. M denotes missing. T denotes trace. Don’t know how to post the above with a monospace font like Courier- it would be a lot more readable with such a font. Just testing.....Robert, you can delete this post. Hopefully this will render better. Pretty hellacious in SoCal the past 24 hours.